Marching band season began with a meeting and rehearsal last night. This will be my 10th season as a band mom. Jim was both the unofficial band doctor and an official band photographer. He tremendously enjoyed both roles, and left me with an archive of thousands of photographs from marching band and concert band seasons. Invariably, Memorial Day would be unbearably humid–worst at parade time, as the marchers gathered in clusters and practiced in a steaming parking lot. Band members’ discomfort would be heightened–if not made intolerable–by their long-sleeved black uniforms. Jim would walk along briskly, both his doctor’s bag and his camera bag slung over his right shoulder. At parades, from careful past observation he knew when he had to stand guard at a particular corner. For example, he deduced the precise spot where, rounding a sharp corner, one flutist reliably would fade to white, crumple, and need to be taken out of the lineup for hydration. Jim has driven a truck with percussion equipment from Florida to New Hampshire. It broke down mid-way, just as the Percussion Ensemble bus once did en route to Ohio. During one week he helped chaperone an enormous band and choir trip. Among the casualties was a percussionist who was hit by a car while charging toward the bus. The percussionist was fine; in fact, for the remainder of the trip he was surrounded by several lovely young ladies who would push his temporary wheelchair to the front of the line at park rides. But after doing his quick assessment of the percussionist, Jim had to devote quite a bit of effort to talking down the terrified staff members who’d witnessed the near carnage. He also was entrusted with breaking the news by telephone to the percussionist’s mother, and with giving follow-up medical reports. As always, he did such things in his calm, measured way. I never once heard him panic. And, as I said at Jim’s Closing Ceremonies, the last place we went where he wanted to go was less than two weeks before he died, when our sons helped him get to a daughter’s winter guard performance in Maine. The last photographs he took were taken there. We spent so many nights together as a family on the band field (where performances occasionally were punctuated by the breaking out of a football game), from the dog days of August band camp to cold-to-the-bone November nights. We all have a lasting family in and from this band. My unflappable spouse was a calming presence in any crisis, and it gave him great joy to watch the band perform. Both we and our children have made wonderful friends through their involvement in making music. The music this band director and percussion ensemble director brought into our lives always has been breathtaking. Listening to it, we felt we had (indirectly) accomplished something of great beauty–at very least through the sheer number of musically gifted children we somehow managed to contribute to this one band. The band dedicated a bench to Jim shortly after he died. Given Jim’s decision to donate his body to his medical school , this bench is a physical memorial we can visit–and it is just as he would have wanted, surrounded by green, with daffodils blooming around it in warmer months. It is a place from which one can think of Jim by looking up to the sky, not down. The bench is a place of rest: it faces the field where our children have spent thousands of hours rehearsing and we have spent hundreds of hours assisting. Amid all the bustle of students rushing around it, someone can take a moment to sit, to contemplate, to enjoy being outside–and to hear the music as the band rehearses. 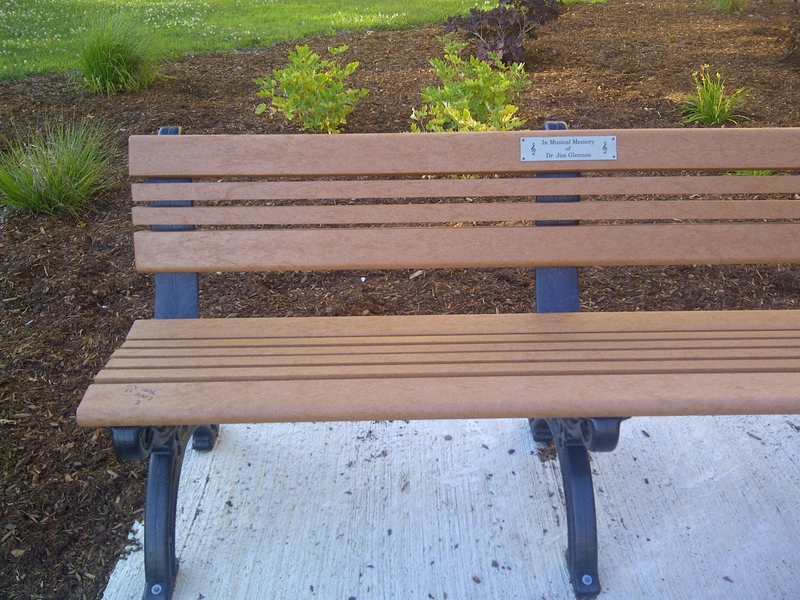 Then I noticed someone had left an extra message on Jim’s bench, facing the plaque at a jaunty angle, and I smiled. 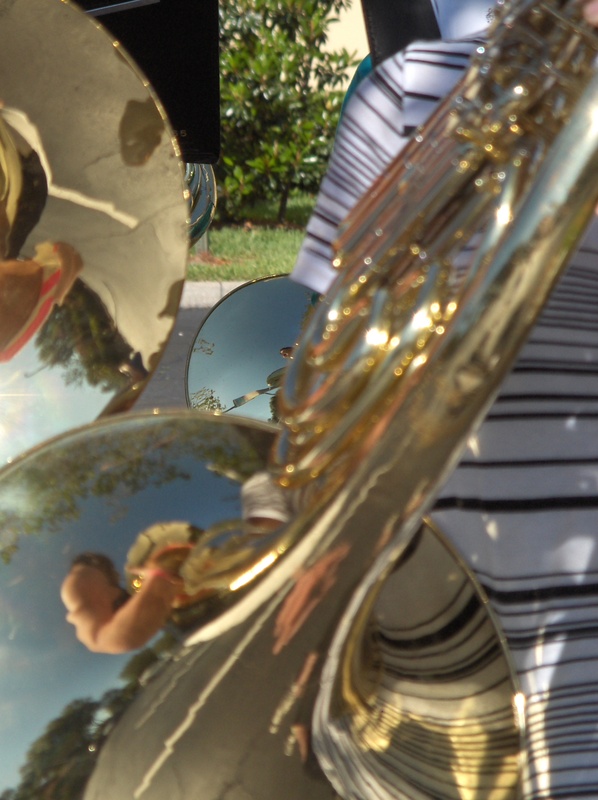 This entry was posted in Love and Loss and tagged band camp, band mom, Boston Pops, Doctor Jim, graffiti, Memorial Day, parade, percussion, photographer. Bookmark the permalink. Lump in throat. I hope you know you are SO lucky to have been band parents. Being the oldest in a 2 part family, where there were babies in my high school years, I did not have “band parents”. They were busy elsewhere.Now I find my daughter has no interest – in part because there is little interest or investment in the arts here. It hurts – I was hoping for a recapitulation of that band magic. I will never have that symbiotic feeling that is part of the ensemble ever again. Not even second hand. You were part of a very special time in those student musicians’ life. Band parents step in and provide some parenting where the parents are absent. . You were lucky to have that experience & your school was lucky to have you. 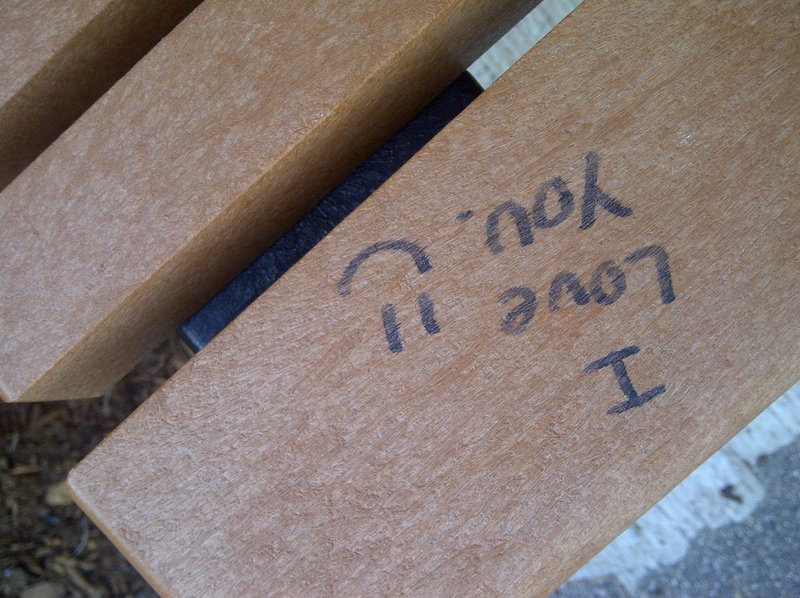 The perfect message on a sacred bench. Jim is smiling down on you for sure. school started each morning, the sun was fully up and we were all drenched in sweat. We were not as fortunate as your band in the physician dept. There wasn’t even a school nurse! And my parents were too busy to come to games or any of that stuff, so, I am grateful for the parents that were there for us. That was freshman year at Scottsdale High School, home of The Beavers – Orange and Black in 1968. By 1969, I had moved on to an evening practice schedule after auditioning for a Rock Band called “Gossip”. We played at all the proms and dances around town. But I digress……Stephanie thank you for reminding me of some memories that were locked way back in my hard drive on an old floppy disk. I had to transfer all the information onto my new thumb drive shaped like a VW Bug that I inserted into my ear. It worked! there’s this initial thought to leave the bench pristine, that immediately gets swept away by the understanding that what any — or at least most — of us would want would be for a memorial to us to be covered in scrawled love notes and happy faces, and a sense of whimsy and life still going on. Reblogged this on Kersee71's Blog. As always, you’ve touched my heart again. From my own experience with the PHS band back in the 70’s (gulp), . . . to our children’s band trips and concerts and parades and games and practices . . . to any opportunity I can find today to help out, this music and arts program has been very dear to me. I would gladly do it all over again and again. You’ve shared many of the wonderful moments and captured the essence of this organization in your writing.. Thank you! Our bond began as GPO moms and I was so glad it continued and we shared many more times together as proud PHS band moms. I attended the spring musical with a friend this year and made a point of bringing her to Jim’s bench. As we sat and enjoyed the lovely weather, I spoke of Jim and you and your fabulous children, the amazing legacy Jim has left and this wonderful blog you are writing. I am so proud to be your friend. Keep doing what you are doing Stephanie. You are making a difference more than you can know. Sending you happy thoughts and prayers.